Well that was very disappointing. This team frustrates the hell out of me. I love Arsenal. I will support the club and the team until the day I die but this particular team annoys the hell out of me. Quite frankly - as I put it in yesterday's instant reaction - the performance was embarrassing. Look at that Blackburn team. They were awful and yet we managed to make them look good. We had the personal there. Theo Walcott and Alex Song started their first games since their injuries. Robin van Persie started up front as did Andrey Arshavin. However there was no Cesc Fabregas and it was not until after the game when the manager spoke to the media did we find out that the player is still mentally not right about playing once he's recovered from a hamstring injury. Our start to the game was bright. We pushed Blackburn into their own half and forced them to defend well to keep us out. Theo Walcott looking bright and was possibly unlucky not to create an early goal when his cross hit Ryan Nelson and trickled wide. Arshavin then played in Walcott minutes later and the Englishman couldn't get the ball past Paul Robinson who saved at his near post. It was the type of start we've not seen for a long time and getting out of the blocks with a spring in our step and on a forward foot was exactly what we needed to do today. Then game the moment which seemed to bring our momentum to a shuddering halt. A right footed Gael Clichy cross was headed wide by Samir Nasri but the misdirection of the header could be explained by Ryan Nelson smashing his head against Nasri's. The Frenchman left the field and Cesc Fabregas began a warm up. But Nasri returned to the field heavily bandaged. He seemed out of it and his passes were not finding their intended target. It put Arsenal's momentum out of kilter and the next 15 minutes were pretty poor. Blackburn won a few free kicks and as expected pumped them long into our box hoping one of their players would find a goal from a set piece. Arsenal found their rhythm again and Andrey Arshavin drove a shot goal wards which Robinson failed to take first time. The best chance of the half fell to Jack Wilshere after good work from Theo Walcott. Walcott's cross found Wilshere unmarked and the Englishman's shot was wide when had he put it either side of the goalkeeper Arsenal would have surely taken the lead. It seemed Manuel Almunia wanted to get in on the action and he left many Gooners with their heart's in their mouths when he spilled a shot which luckily found its way around his left hand post. As we headed towards the break, Almunia had another moment. He came for a cross he was in no way able to claim and when he failed to reach the ball it was lucky for the Spaniard that the Blackburn header went wide, this time rolling past his right hand post. There were warning signs that Almunia was going to make a mistake. Luckily for us we got to half time without one. But it appears to me his confidence is shot and I'd heard that had Jens Lehmann come through with a better performance for the reserves in midweek against Wigan, the German would have started yesterday. At one point in the half, Arshavin busted his gut to get back and make a tackle. Yesterday he deserves his place in the team. He looked bright. He could sense we had an opportunity to win and was involved with everything which was positive about Arsenal's game. When he won the ball in that challenge, I like many around me got to our feet to applaud him. He got a huge cheer and it just goes to show the reaction you get when you are visibly seen to put the effort in. So 0-0 at half time and there were some positives. However, as we've seen with the game against Sunderland recently, organise yourself well and this Arsenal team struggle. There were no changes at the break and we started the second half brightly. Nasri put Wilshere in but instead of taking the chance to shoot he chickened out and crossed the ball into an area where the Blackburn defenders were racing back into protect. Wilshere really should have taken the chance himself. But all too often we see players elect to pass rather than have a go. It seems sometimes they are scared of scoring. What annoys supporters most is us creating chances but not shooting. I've never once heard a supporter get annoyed with us shooting rather the opposite. The frustration builds when we don't take a shot when in good positions. Arsene Wenger then went and made one of the most bizarre substitutions I've ever seen him make in his time at Arsenal. He took off Arshavin and brought on Cesc Fabregas. I have no problem with Fabregas coming on but Arshavin was one of our brightest players and deserved his place on the pitch. He may well have tired towards the end of the game having played 180 minutes in two games for Russia. But that change could have been made later. I thought the man to take off was Alex Song, who hadn't in my eyes done enough during the game so far. The question must be also be asked: Why do we need two deep lying midfielders at home against a team who were playing with ten men behind the ball? I know the Squillaci/Koscielny partnership doesn't help the nerves, but I thought they coped well with what was thrown at them. Fabregas came into the centre behind van Persie and Nasri went wide on the left handside of attack. It was pretty much all Arsenal. Van Persie had a go at goal which was saved and the momentum was with us. Chamakh replaced Walcott who had faded during the second half. The Moroccan took the central role with van Persie switching to the left and Nasri on the right. Then came the moment which might have changed the game, had we been playing against a team who weren't as defensive as Blackburn. An awful two footed lunge by N'Zonzi on Koscielny saw Phil Dowd bring out a straight red for the Blackburn man. Bendtner was thrown on for Nasri and took his place on the right. We then started to create chances with Bendtner and Chamakh on the pitch, something we'd been crying out for since the 60th minute. We were finding width to run into with the ball but prior to their arrival on the pitch only van Persie was trying to get on the end of them. Now we had more to aim for. The crowd did its best to lift the team with some noise. Van Persie created some room for Wilshere to drive into the box with an audacious back heal but yet again the 19-year-old tried to find a team mate rather than the back of the net. The cut back found Chamakh but he had a sea of bodies in front of him rather than just Robinson who Wilshere had to beat. There were headers from van Persie, Chamakh and Bendtner but none of them could find the target. And there it ended 0-0. There were boos at the final whistle. They didn't last long because many people had already left the ground. Arsene Wenger had said our home form would win our lose us the title and he was right. Another draw with Manchester United winning saw us fall to seven point behind the league leaders with eight games to go. We still have a game in hand and to played Ferguson's men at the Grove but I just felt yesterday was pivotal in the title race. We still have a chance. It's getting slimmer every time we play. But this team has to find some winning form quickly and a player who will put the ball in the back of the net. Arsene Wenger took longer than usual to attend his post match press conference. He locked the players into the dressing room to talk with them for longer than usual in the post match debrief. "It was a frustrating performance because we had no pace in our game. Overall it was a flat performance with a lack of energy level, a lack of sharpness. It was quite a big concern to see what we have seen today." He answered some probing questions from the media post match. Probably one of his most enlightening press conferences. He didn't pull his punches on this team and rightly laid some of the blame for the result at their door. But the manager must also shoulder some of the blame as well. For me the Arshavin substitution was a poor decision. He was also too slow to bring on Chamakh and Bendtner when it was obvious our game needed to change. 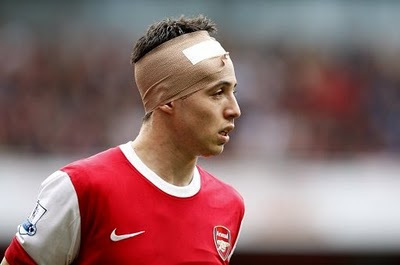 I think taking off Nasri in the first half wouldn't have been a bad decision either because the Frenchman didn't come back on to the pitch with a clear head. There appears to be something fundamentally wrong with this team. We had players jogging back who didn't want to take responsibility for winning the ball back. They deceive us as fans. They get into this position in April, when we have a serious chance of winning the league yet don't seem to realise the importance of winning yesterday's game. It's like they didn't want it. Perhaps it is too easy to finish second. If Abou Diaby or Denilson had of played yesterday they would have come in for criticism just for being on the pitch. But yesterday we played aruably our strongest team but for missing Szczesny and Djourou/Vermaelen. Why couldn't they do it? Why didn't they put the extra effort in? It's baffling. Motivation is also key. How come with lesser technically gifted players than Arsene Wenger can Alex Ferguson get his team to come from 2-0 to beat West Ham? There are some serious questions to be answered and hopefully that games yesterday has opened Wenger's eyes on why he does need to freshen the squad up this summer. I'm not going to get into a depression just yet because we can still win the league. But yesterday was a body blow and I just hope we can recover. Away from the game, The People report we're monitoring the situation of Marseille left-back Taye Taiwo. The 25 year-old is a Nigeria international who will leave Marseille on a free transfer this summer. The speculation about Clichy leaving is very real. He is stonewalling on a new deal, so the manager, who was yesterday linked with Leighton Baines, is right to step up the scouting of potential replacements. The People also suggest Everton have already asked Arsenal about the possibility of taking Ignasi Miquel on loan next season. Meanwhile the Daily Star Sunday stay have linked us with QPR's stand out player of the season Adel Taarabt. Taarabt went to Spurs when he came to England four years ago under the advice of Damien Comolli. However he's spoken recently about the regret of making that decision and the Star have cobbled together a story which links us with the player.